Welcome back to Laundry School—here comes THE BIG ONE. Today we’re taking on stains and smells. 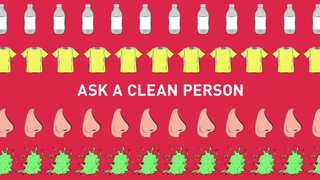 Since Laundry School is meant to be broader and more about fundamentals than about specifics, I deliberately chose questions that came up over and over again, so that we could hit the most common stain and smell problems that people encounter come washday. And were there ever some common ones! I lost count of the number of questions about pit stains, is what I’m trying to say to you. I have all of these workout shirts (Under Armour and Nike Dri-fit materials mostly), and I can’t get the sweat smell out of them. So, when they’re “clean,” they still smell bad. Any suggestions? I wash them separately from non-workout clothes, and I’ve tried different things (white vinegar) with most poor results. There were, it will surprise you not, a ton of questions about lingering smell situations in laundry. Mostly the questions centered around gym clothes, which are the most likely to retain that pit-y, crotch-y smell. I picked this particular question because of the mention of white vinegar—my magic solution has failed you! How ever will I recover?!?! (I’ll recover.) The white vinegar is a good choice for eliminating odors, but there are other things you can try as well if you find it’s not enough to blast out smells. The first thing is to try using a lower heat setting on the dryer. High and even medium heat drying can amplify smells, so switch to low- or no-heat drying or, if you setup allows for it, air drying. In terms of products, you could always bump up the amount of vinegar you’re using and see if that helps. If not, Borax does a good job at killing smells, as do sporting-gear-specific detergents like Win, Nathan Sport-Wash and Sports Suds. And you should, of course, consult the literature for more. I’m generally pretty good about retiring shirts when it’s their time. But I have some favorites that have been around for six or more years, and are still in great shape fabric- and seam-wise. However, they’ve started to smell a bit “stale” even when they’re fresh out of the dryer, and even though I store them in a drawer with cedar blocks. What’s causing that, and is there anything I can do to fix it? I mentioned that most of the questions about smell retention centered on sports gear, but this is a thing that can happen in your regular clothing. If it happens to you, try the white vinegar and a lower-heat dryer setting. That should do it! If not, one of those sports detergents or a scoop of Borax will likely be the ticket for you. A recent episode of the Cleancast took on this very subject, so for more on the topic, give it a listen. What should I do with workout clothes when it’s going to be a day or two between making them disgusting and accumulating enough similarly foul clothing to do a load of laundry? Speaking of the Cleancast! We talked about this very problem on that same episode on smells and pit stains. The best solution to the problem of soggy gym clothes is to hang them to dry before tossing them in the hamper or laundry bag. Some people drape the clothes over the side of the hamper or shower-curtain rod. Pants hangers, with their little clippy bits, are also helpful for drying out damp workout gear. If you have a secure outdoor area in which to do that, the fresh air will not only help to dry things out, but will also allow some of the odors to waft away. I have a bunch of T-shirts that have white pit stains from using too much deodorant. I’ve used OxiClean pretreating stuff and OxiClean in the wash, but it’s only reduced the stains, not gotten rid of them completely. Because you’ve already had good luck with the OxiClean, I would recommend giving the shirts another go with the stuff, but treat them to an extra-long soak. You should also consider getting a laundry brush so as to give the stained areas a more heavy-duty scrubbing. The long soak is a thing we covered in our Laundry School lesson on detergents, bleaches, and boosters, so head to the last question in that post for more on the subject. I have a cream-coloured track top that has some stubborn grime that hasn’t come out in the wash (mostly mud). Any way other than dry cleaning to get dried-in stains out? The other thing is to use a pretreatment product on the stains—a laundry bar like Fels-Naptha is a good choice for older, more set-in stains, but spray treatments like Biokleen Bac-Out, Zout, Simple Green, etc. are also quite good. Give the stains a pretty heavy dose, allow the treatment to sit for 30 minutes, and then launder the garment as usual, checking to be sure the stains are gone before drying. I do lots of part-time work as an entertainer at casino theme parties. I’m a dealer for these parties, doing blackjack, craps, roulette, etc. The “uniform” includes a white dress shirt and bow tie. Well, some of the events are in warm rooms, and some of the games (craps, for example) require me to move around a lot and be active. This is a bad combination, and I end up sweating a lot. I have a T-shirt on underneath my dress shirt to help with sweat absorption, but the area of my shirt that gets ruined faster than any other area is the collar. As I’m sweating, the sweat just collects on my neck, and turns the top of my collar yellow. It becomes gross and noticeable, and so I’m having to replace my tuxedo shirts ever couple of months. I don’t get paid well enough to buy new shirts every month, and the company doesn’t supply the shirts. So, I’ve gotta get the most mileage I can out of every shirt. How can I keep them clean, and what do I do with the shirts that already have yellow collar? Ah yes, ring around the collar. It’s a subject I wrote a pretty extensive post about, way back in January of 2014; given that literature exists on the topic, I’ll keep this fairly short and direct you there. The quick and dirty answer is that you should treat the collars (and cuffs, if you find that you’re having similar grime problems on that part of the shirt) with a pretreatment product. Zout, Shout, assorted other -outs ... those will all be good options. For the shirts that have older, more set-in stains, the key will be—all together now! — to give them a long soak in an oxygenated bleach solution or, since they’re white shirts, hit them with the Cascade Method outlined in this post on white dress shirts. This sounds like an easy question, I know. JUST VACUUM THE DAMN THINGS. But it’s not so simple. No matter how hard I try, I can’t get the hair from my two goldens out of my laundry. Advice? Sure thing! Actually, before we get into it, pet hair is a topic that was the subject of the very first Cleancast, so go listen to that. It was a fun one! My former editor and noted cat lady Choire Sicha was my guest and it was just a fun time all in all. So yes, vacuuming is one way to keep hair at bay. But here’s another, easier thing you can do: Get one of those Love Glove dealies and do your very best not to make every bad joke that I’ve ever made about them, because oh, God, that name! So pervy. Love it. In addition to having a marvelously pervy-sounding name, the Love Glove can be used not only on your doggie’s coat to remove loose hair and keep shedding to a minimum, it can also be used on your clothes to quickly take fur off of them before they go in the laundry (or, I guess, before you go out the door). I am a ChapStick addict. I use them daily, and in my lifetime have completed six entire ChapSticks without losing them. Unfortunately, I also frequently forget to remove them from my pockets before washing my pants. I have done this so often that I now only buy colorless kinds to prevent as much color staining as possible. Even still, the colorless kind leave slightly darker spots on my clothes where the ChapStick oils have set. Repeated washing seems to get them out kind of, but not completely. Is there any hope for a ChapStick addict like myself? P.S. Please don’t lecture me about going through my pockets before washing. Sometimes those sneaky ChapStick bastards still make it through!! You asked nicely, what with the “please” and all, but still: You really gotta take up a pants-checking habit, pal! Put a sign above your washer, or by your hamper, or tattoo it on your laundry-sorting hand, whatever it takes. A person who is so devoted to ChapStick the he knows his precise number of lifetime completions also needs to commit to a pocket-checking routine, sorry. With that said, ChapStick stains can be removed if you know what to use. And that’s what I’m going to tell you RIGHT NOW: Because they’re oil-based stains, you need to use a pretreatment product that can attack grease. Regular readers of this column (lovers, every last one of you) know that means that the words “Lestoil” and “Pine Sol” are coming down the pike, and oh! There they are. So right, Lestoil and Pine Sol are my go-to recommendations for products to use to spot-treat grease or oil stains before laundering. Dawn dish soap is another good option. For something more heavy duty, citrus degreasers, like De-Solv-It or Trewax Natural Orange Heavy Duty Cleaner/Degreaser, can double as laundry pretreatment products. One other thing to keep in mind when working with oil or grease stains: Often, when oil-stained clothing comes out of the wash, it’s difficult to determine if the stain is gone or not. When in doubt, don’t put the garment in the dryer, which will set the stain in. Better to err on the side of caution and let the thing air dry. If the stain came out, great. If it didn’t, give it another shot of stain-remover and launder again; sometimes these things just take two tries. Let’s say I have my mostest favoritest tailgating Pitt hoodie. I will get grease on it, there’s no doubt about it, because I am a gigantic blubberous slob. I’ve tried pretreating, I’ve tried vinegar (? ), I’ve even read the little tag inside and did the things it has said. At what point do I just throw it out, but a new hoodie, and shamefully wear a poncho any time I eat anything with grease? I suspect that the stained and beloved sweatshirt has been through the dryer a few times and that those grease stains are set way, way in. HOWEVER. You could try hitting those older stains with Lestoil/Pine Sol/citrus degreaser, letting those things sit for, oh let’s say an hour or so? Sure. Then launder. You could also see if one of my LONG SOAKS works. Or you could break out the big guns and try K2r. You know? I bet K2r will do it. Listen, I gotta wrap this baby up, but I PROMISE that someday very soon I will tell you my K2r story and make believers out of all of you. For now, trust me on this one, and until next week, class dismissed!